The boys are building a pirate ship, they talk about how the arrange the blocks and why. As they start building other boys came to join in. This Pirate ship idea was then transferred to the hill area in the outdoor space. The Pirate theme kept going for a whole 2 weeks in Reception. Children enjoyed making up Pirate stories about travelling to different countries and finding treasures. In Blue Class our role play area has changed to a Vets. The children are learning how to take care of sick animals. 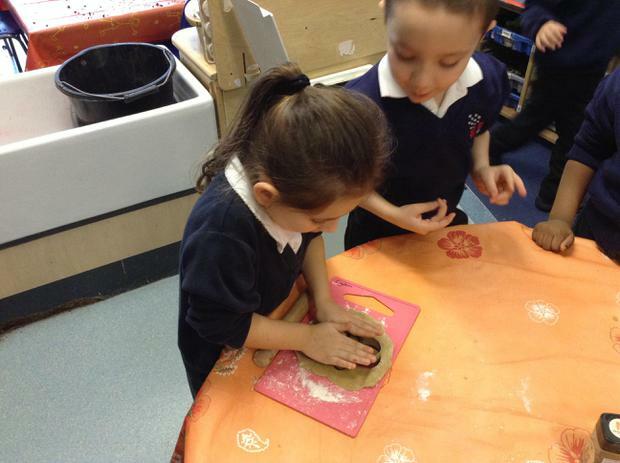 The children use language to imagine and recreate roles and experiences. The children also show an understanding of how different instruments maybe used at the Vet. They check if the animals are ill. “Let me check”, the ‘Vet’ presses the stethoscope on the soft toy. One of the other children comes over, “Come doctor” and takes the ‘doctor’ over to another soft toy. 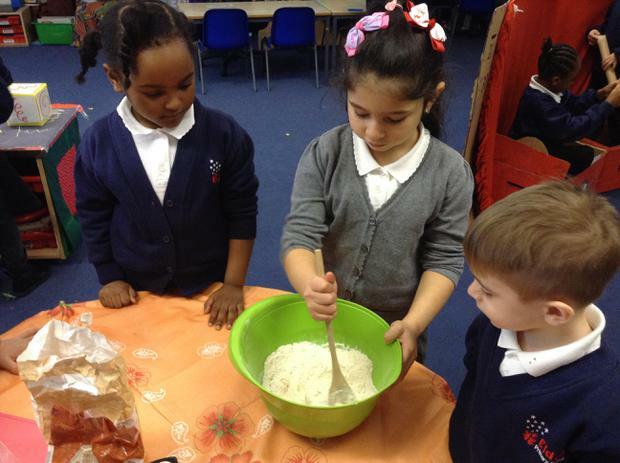 This week in Blue class we have been reading the story of ‘The Gingerbread Man’. 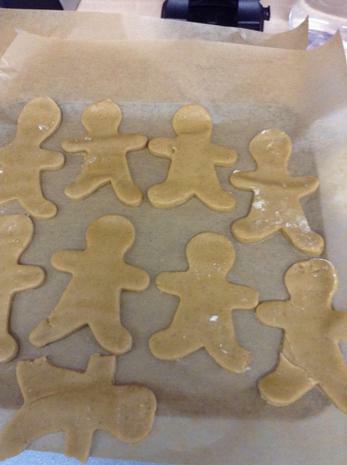 We made Gingerbread Men of our own. 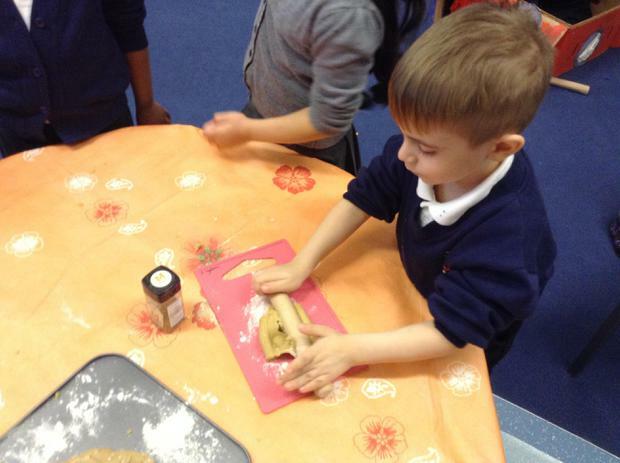 After making our Gingerbread Men we discussed how we made our Ginger bread men and write the instructions to follow. This helped us build our communication and language skills in organising and sequencing events. In Blue Class we have set up our new role play train station. 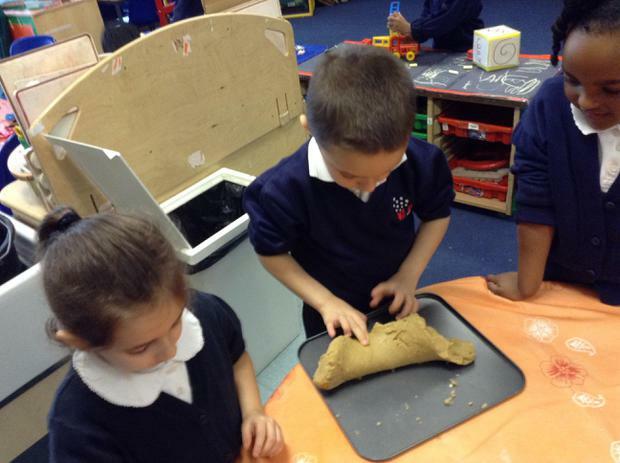 The children have been busy using their imagination to engage with this role play area. The boys check the map to see where they are going and pick up lots of train passengers along the way. The children are using new vocabulary based on our story ‘The Train Ride’ to imagine and recreate roles and experiences in play situations. In Blue Class we have been dressing up as Prince and Princesses and talking about the things that we would like if we were a prince or a princess. “I would be prince, happy birthday”. “I would like a rainbow lipstick”. In our outdoor area we use puppets to role-play different stories. Some of the children are practising using their story voices when using the puppets.